Back in the old days, when 64-bit computing was still a novel concept and RISC vs. CISC wars were still fought, HP and Intel joined forces to develop the next-generation CPU. It would be 64-bit only and it would have a new type of architecture called EPIC. That was in 1994. As the new partners soon found out, developing an entirely new type of CPU architecture is a major undertaking. Not only had they to design the CPU itself, but also new compiler capabilities were required. It did not help that HP and Intel, not having cooperated on such a large scale before, had differing priorities and company cultures. While HP and Intel were hard at work pouring billions into the development, alliances to create the unified UNIX OS formed and broke up as everybody was positioning themselves to dominate the soon-to-be multi-billion dollar market. In the mid-90s, Itanium was all the hype. 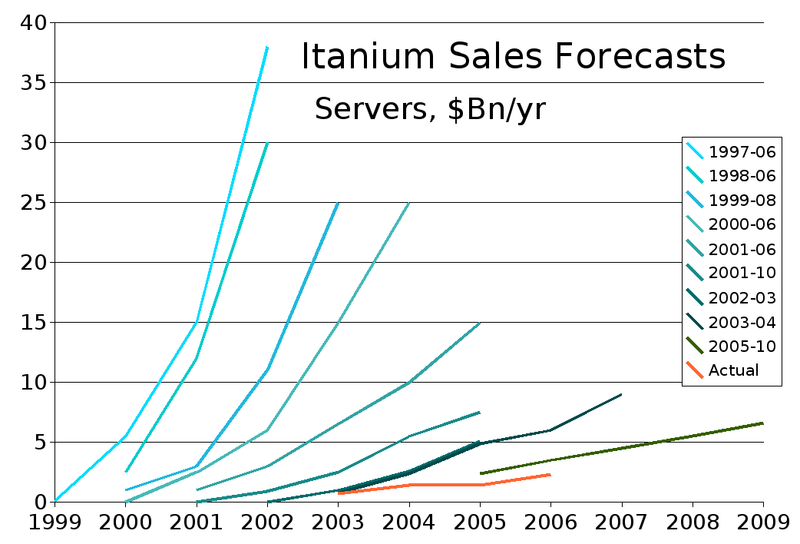 In ’97 IDC forecast global Itanium sales of $38 billion for the year 2001 (!). Vendor after vendor announced they would build Itanium machines: Compaq in ’96, Dell in ’97, IBM in ’98. Compaq even gave up their Alpha line of CPUs in favor of the Itanium. By 1999, when Intel announced the name “Itanium”, the many delays of the still not shipping product caused sarcastic commenters to refrain to it as “Itanic”. A year earlier IBM’s 64-bit RISC CPU POWER3 had been introduced. Itanium’s 64-bit capabilities were not unique any more. When the CPU finally shipped in 2001, its performance was low and the price high. The Itanium 2, quickly released a year later, did not substantially change the game, since the gravest problem of all remained: native IA-64 software was scarce, and the built-in hardware x86 emulator was way too slow. In 2003, AMD released the Opteron, the first x86 processor with the 64-bit extension AMD64. Intel was forced to react and added EM64T (later renamed to “Intel 64”) first to their server CPUs in 2004 and later to desktop and even mobile processors. With AMD driving innovation in the first half of the decade, the pace of development in the x86 world quickened. This resulted in Intel’s switch to the (64-bit capable) Core architecture, which offers great integer and, as of late, also high floating point performance, surpassing Itanium’s capabilities by far. Competition drives innovation, and competition is fierce in the x86 market, as in most mass markets. This led to a very quick evolution of the platform, with ever higher performance at constantly low prices. Itanium could not withstand that pressure. Not at its high prices and relatively poor x86 (32-bit) performance. Soon, Itanium’s market share will have withered away to nothing. In 2007 only 55,000 Itanium-based systems were sold, 80% of those by HP. A year later, HP was practically the only vendor left with an estimated share of the dwindling Itanium market of 95%. Unisys, one of the last vendors left, quit in February of 2009, citing their x86 machines’ higher performance at lower cost. HP, having invested so heavily into the IA-64 architecture, giving up the Alpha and PA-RISC platforms in the process, might cling a little longer to the sinking ship. But eventually even they will have to let go. It will be a silent burial. Great information there, thanks for posting that. It’s interested to still see Microsoft providing an IA64 build of Windows Server, I presume that won’t last past Windows 2008 R2.